The vowel at the end of the winery’s name, and the grape, threw me off. Uvaggio is located in California — Lodi, to be exact. It can get warm in Lodi, which is one of the reasons the area is so wonderful for Zinfandel. It’s also the reason you get riper, richer, honeyed, and tropical fruit flavors from this Vermentino — a grape generally grown in cooler climates such as Liguria and Piedmont (where it’s called Favorita). Perhaps the finest examples of Vermentino come from the island Sardinia, which one would think is warmer when seen on a map, but in fact tends to experience a more continental climate due to its mix of mountains and valleys (less than 20% of the island is flat) and frequent sniffs of France’s mistral winds. But over the last decade, warmer regions — such as Tuscany — have been growing Vermentino and the results have been impressive. So why not give the grape a try in Lodi, California? As mentioned at the outset, this particular example from Uvaggio retains much of the character an experienced geek expects from Vermentino — mineral notes, delicate floral aromas, citrus. However, there’s definitely a “New World” style weaved in, perhaps the result of the warmer climate combined with some cellar techniques — maybe some of it went through a malolactic process to create the plush texture, and/or a kiss of oak is behind the sweet vanilla. On its own, is a pleasant sipper. With food, it’s lacking acidity to stand up to richer dishes, but should pair nicely with lean meats and simply grilled fish. 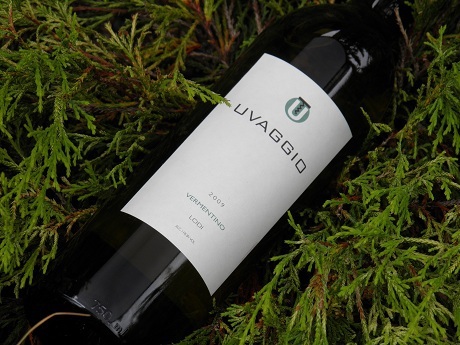 Read other reviews of Uvaggio Vermentino from my pal Jon Thorsen at The Reverse Wine Snob, Winethropology, James the Wine Guy, and Avvinare.